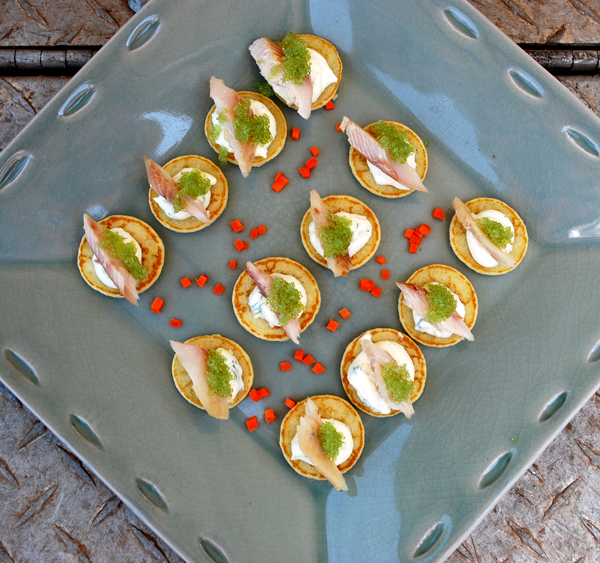 If you're looking for an elegant appetizer to serve for New Year's Eve or at any party where you want to impress your guests, these Smoked Trout Blinis are a snap to assemble and look like a million dollars, especially if you buy the blinis. Blinis are more readily available in upscale supermarkets these days but if you can 't find them, a traditional unsweetened pancake mix works just fine. Add a bit more water than you would for regular pancakes (the batter should be thinner) and drop silver dollar size portions onto your skillet. Make a good quantity for the appetizers and enough extras to satisfy the inevitable taste testers who gather round to watch. A good quality smoked trout, a container of creme fraiche, and wasabi tobiko caviar are what we use to complete the dish. Sour cream could work in a pinch but doesn 't have the luxurious mouth feel of creme fraiche. Tobiko is flying fish roe and is available in several different flavors. Another type of caviar could work as well if you can 't find the tobiko. Combine the ingredients as shown! That 's it! Really!